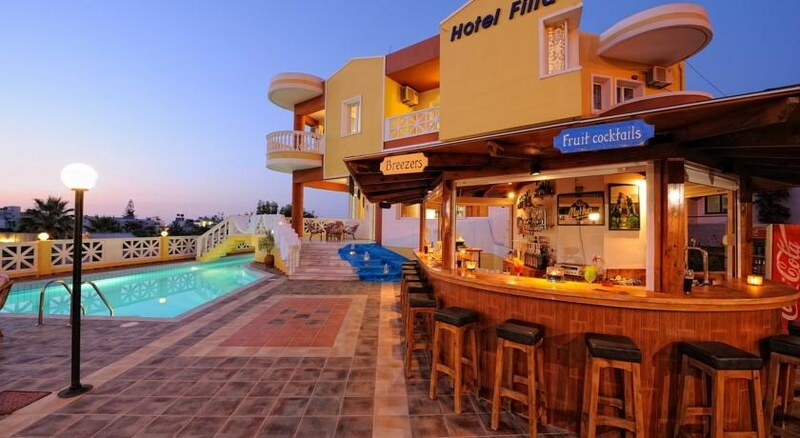 The Hotel Filia is located in the charming village of Stalis, just a short drive from the bustling resorts of Malia and Hersonissos on the island paradise of Crete. This is a terrific hotel for couples and families with 40 comfortable apartments boasting a host of amenities. Situated on the Old Main Road and just a 3 minutes' walk from the beach and the centre of Stalis, guests to the Hotel Filia can discover marvellous beaches and sleepy villages along with a wide array of shops, restaurants, traditional tavernas and "ouzerias" and attractions nearby. Heraklion Airport is 30 km from the hotel. Local Tips: The hotel is perfect for visits to museums like the Archaeological Museum, the Natural History Museum and the Historical Museum of Crete, all three of which are located in Heraklion, and the Minoan archaeological sites of Malia and of Knossos. 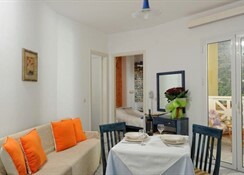 Food, drink and entertainment: Self catering apartments with a choice of bed & breakfast, or half board. The hotel has a dining and bar area with a wide range of food choices, a pool bar serving snacks and drinks, a lounge area with comfy chairs and sofas, Big Screen Satellite TV, as well as arranged excursions and entertainment, and a BBQ evening once a week. 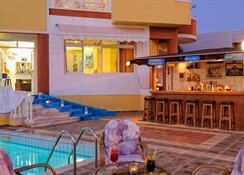 Sports, games and activities: Large swimming pool with free sun beds and umbrellas, childrens pool, pool table, darts board. There are several water fun parks in the area and water sports such as catamaran, pedaloes, canoes and windsurfing are available at the beach (local charge). Additional: Reception 8 am to 2 am guests arriving outside these times should provide arrival time in 'Special Requests' to ensure staff are on hand to check them in on arrival, wheelchair friendly (accessible for guests with kinetic disability), Internet corner & Wi-Fi Internet connection, night porter. The Hotel Filia features apartments with double and single beds, each enjoying a sea view, garden / pool view or view to the mountains. All apartments have air conditioning (charged at local rates), winter heating, private bathroom with showers, balcony, dining area, telephone, kitchen with 2-ring electric hob and electric water cooker, fridge, in room safe (charged at local rates), telephone, TV and hairdryer. Room configurations include Maisonettes for up to 4 persons, Superior apartments for up to 3 persons, Studios for 2 persons, Apartments for up to 4 persons with land view and also with pool/side sea view.